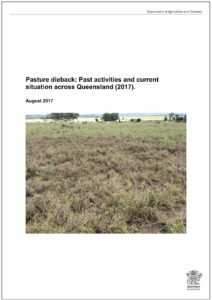 ‘Pasture dieback: past activities and current situation across Queensland (2017)’ describes the current situation of pasture dieback across Queensland, specifically areas, locations and grass species impacted, climate, geographical and managerial impacts, and remedial management techniques being implemented. It includes a review of published literature about pasture dieback both nationally and internationally, including findings of past and recent research and field sampling. It also provides recommendations for future research, development and extension priorities. Author: Stuart Buck, Senior Agronomist (Sown Pastures), Department of Agriculture and Fisheries (PDF, 2MB).